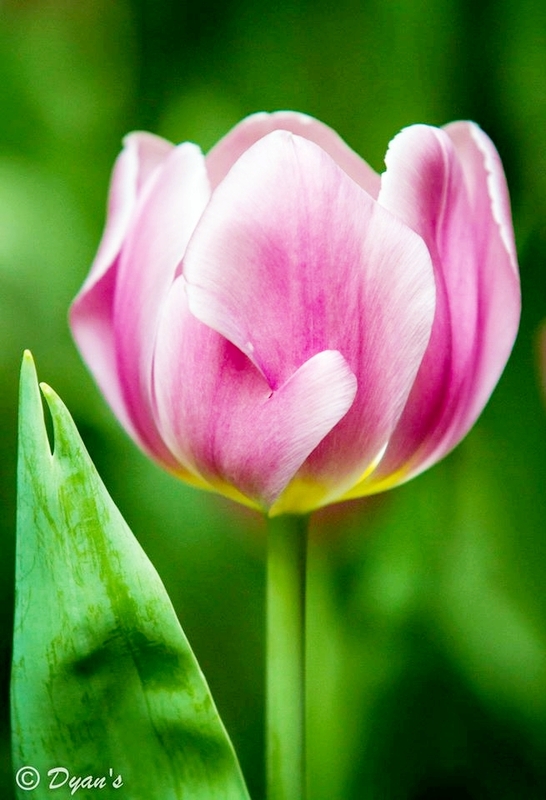 On Wikipedia, Pink is described as a pale red color, which takes its name from the flower of the same name. According to surveys in Europe and the United States, pink is the color most commonly associated with charm, politeness, sensitivity, tenderness, sweetness, childhood, the feminine, and the romantic. When combined with violet or black, it is associated with eroticism and seduction. So pink is a very powerful color as we can see from the description from Wiki. In PPSG’s context, it is not about sexism although pink is often related to female, however, it is more associated with the type of photos that Pink Photographers SG takes. 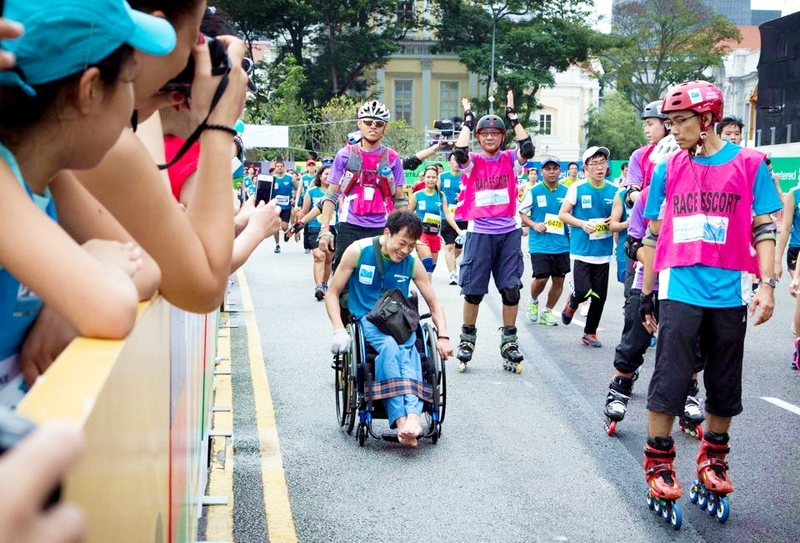 A Wheel Chair participant at a run escorted by Race Escorts donned in PINK Vest. PINK stands out naturally at sports events. And in this case, it’s not just about being seen, it also means CARE! 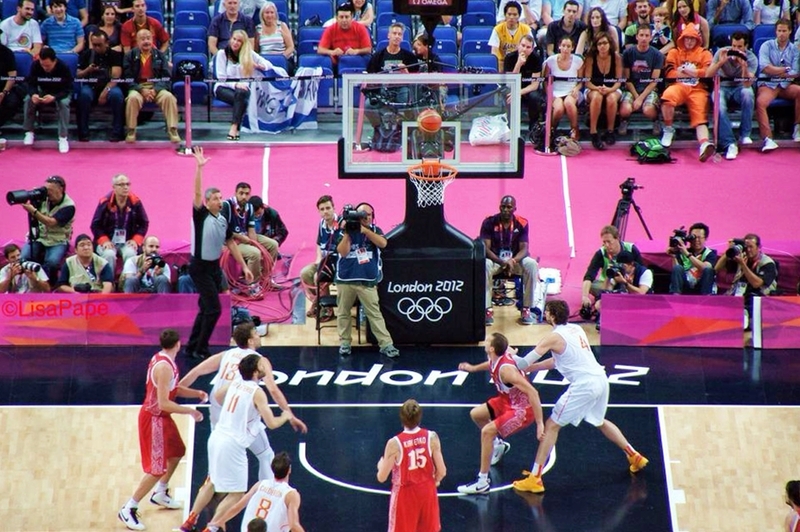 At a basketball match during the London 2012 Olympics, the secondary court or the court parameters – often a distance space between the audience & the court for exclusive access to game marshals, photographers, players, coaches & helpers. 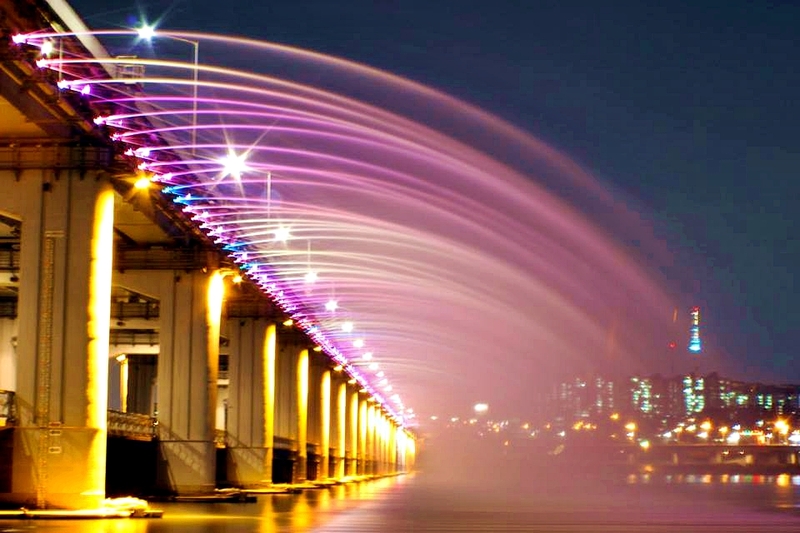 A water feature display with pink lights off a bridge in Korea. The pink light was diffused via the water spray and this is a sight to behold and spectacular to watch. 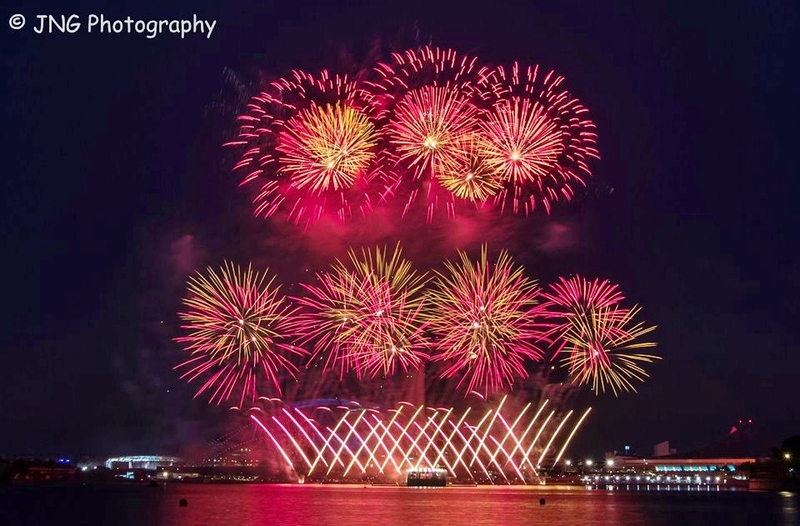 PINK Fireworks being observed at the Singapore’s National Day Rehearsal 2014. Singapore is one of the very few countries in the world that has many National Day rehearsals leading up to the actual day and it is open to the public! 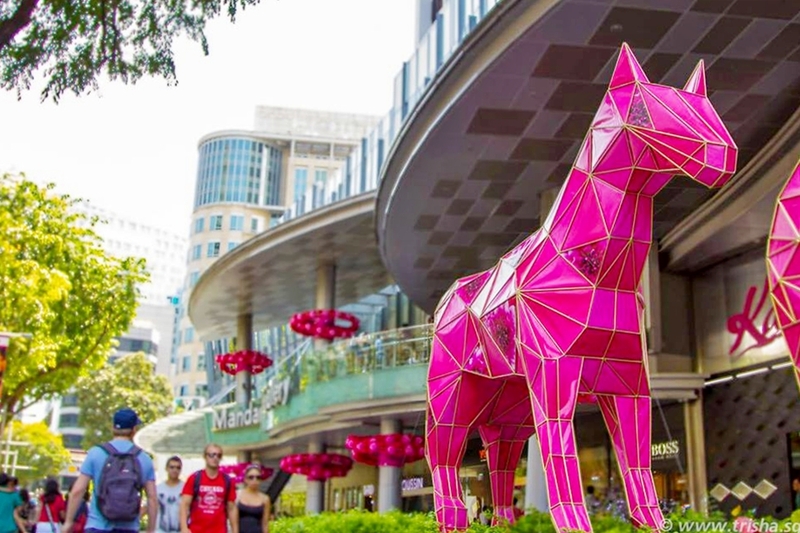 A Pink Horse display along Orchard Road, Singapore during the festive seasons (Christmas/ CNY) the PINK Horse attracts lots of attention from both tourists & locals alike to take photo of it. PINK Converse shoes. Many of us grew up with this brand and it is one of Singapore’s favourites (if you are born from 1973-1983 you will understand). 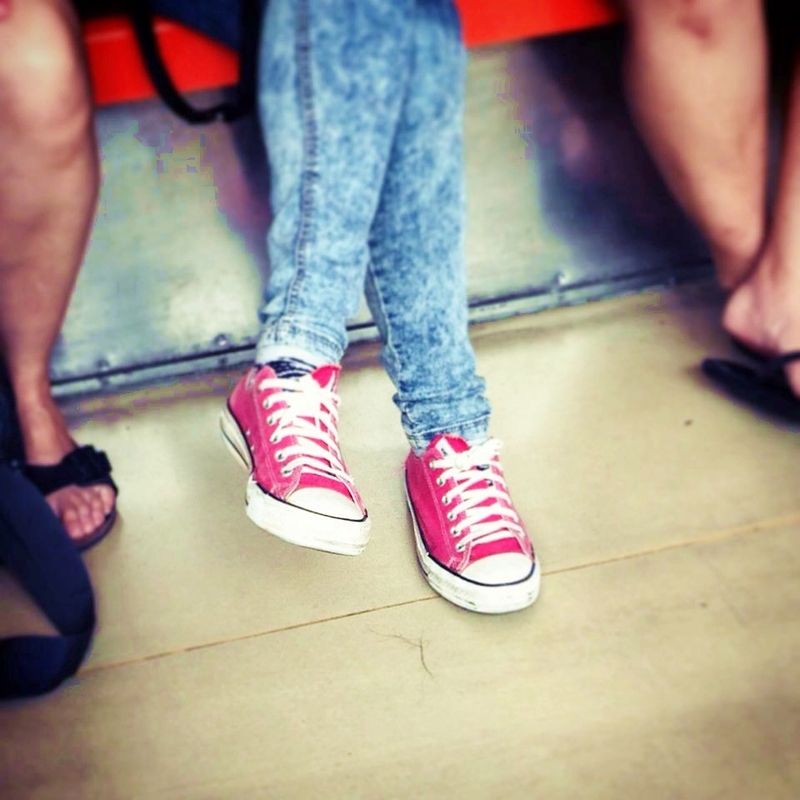 Pink shoes are no longer stereotyped as “sissy” like back in those days, today it’s a loud fashion statement. A sweet couple strolling down town with a dozen Pink Balloons! How romantic is that? To be honest, not many will dare to do this unless you are fueled by love! 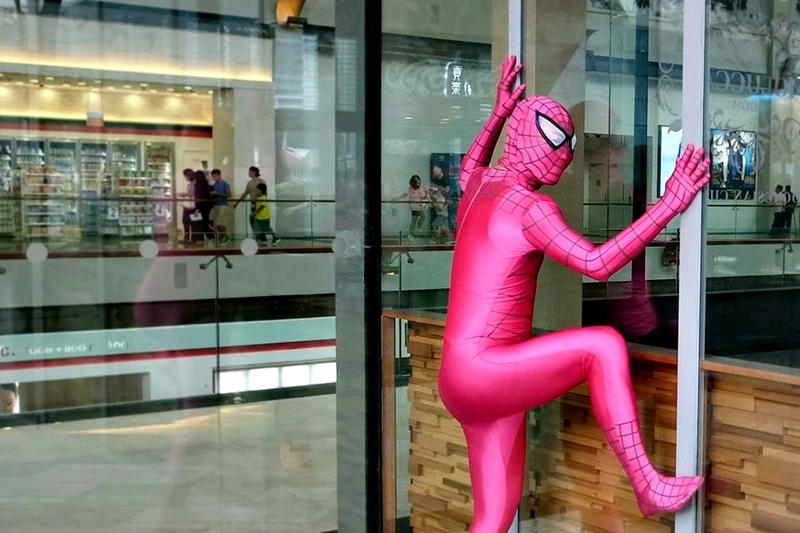 The Pink Spiderman spotted again this time at the Shoppes! 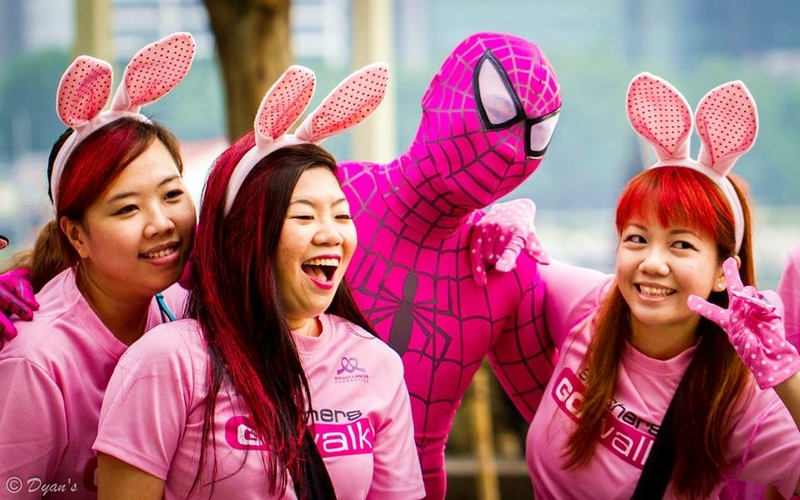 We are not too sure if this Sweet Pink Spidey is the same one spotted by Dyan at the Pink Ribbon Run, but we still think this dude is awesome! Pink Flowers! For some strange reasons, we think that this is nature’s way of telling us that nature loves us too. Sweet isn’t it? Pink flowers look especially elegant again a dark background just like this example. Pink & green in perfect unison. Both colors are rarely matching in most situations but in nature, this is perfect. Simply perfect & perfectly expressed by the photographer of this photo. 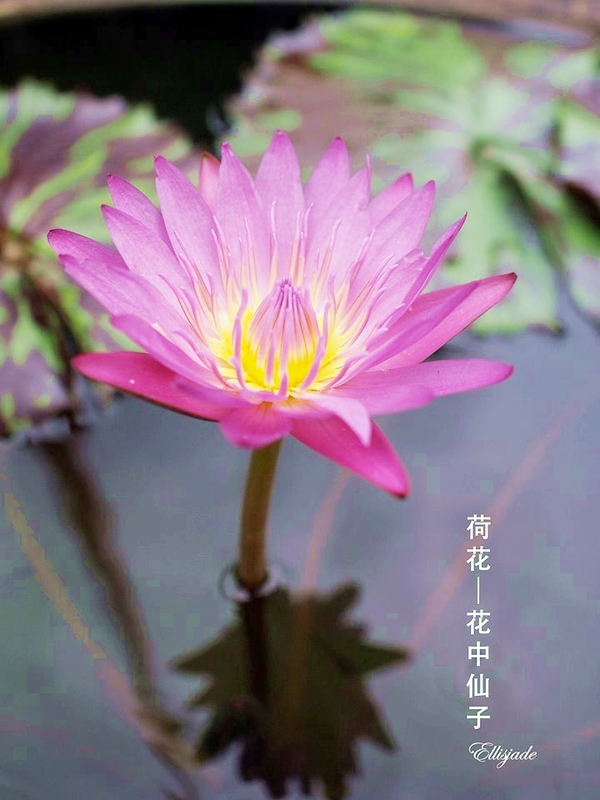 The PINK Lotus flower is one of the most photographed flower in Singapore and other parts of Asia. It is also a wonder in the floral & fauna kingdom as the beautiful Lotus Flower thrives in the dirtiest of muddy water and yet when the flower booms, the flower is not stained by the mud. 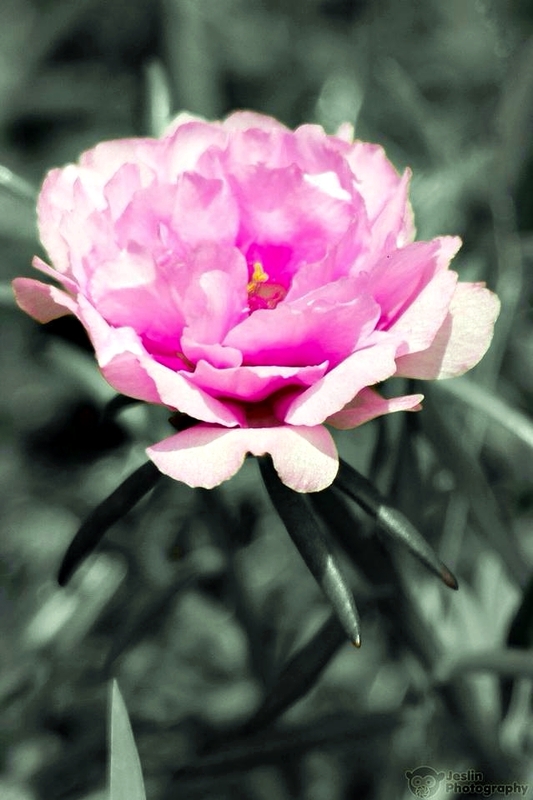 A Pink flower against a monochromatic background is interesting. The background allows the pink flower to dominate as a solo subject while the pink compliments the various shades of black & grey. A simple and yet powerful photo. 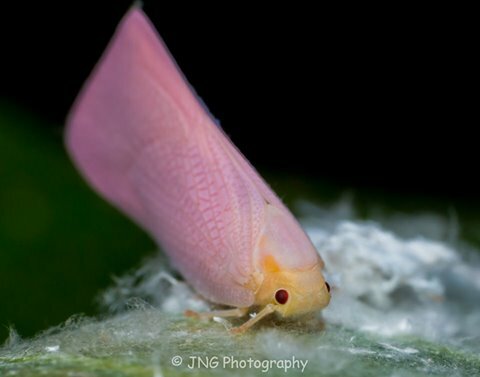 A Pink Plant Hopper commonly seen in our reserves and parks. A quick check with a few macro enthusiasts revealed that most of these pink plant hoppers are spotted at the reserves nearer to the North of Singapore. The last time I shot on of these was at Venus Drive trail. A Pink Flower with a Dark colored Stamen added lots of feel to this photo. Many would think that removing the stamen will make this photo perfect, in actual fact, the stamen had added an element to this photo – it is called REAL. The stamen had made the photo more realistic although “less perfect” by photography standards, take a few moments to look at this photo you will understand what I meant. While many photographers will love to shoot a flower as a whole, there are details that are not exactly visible on first look. 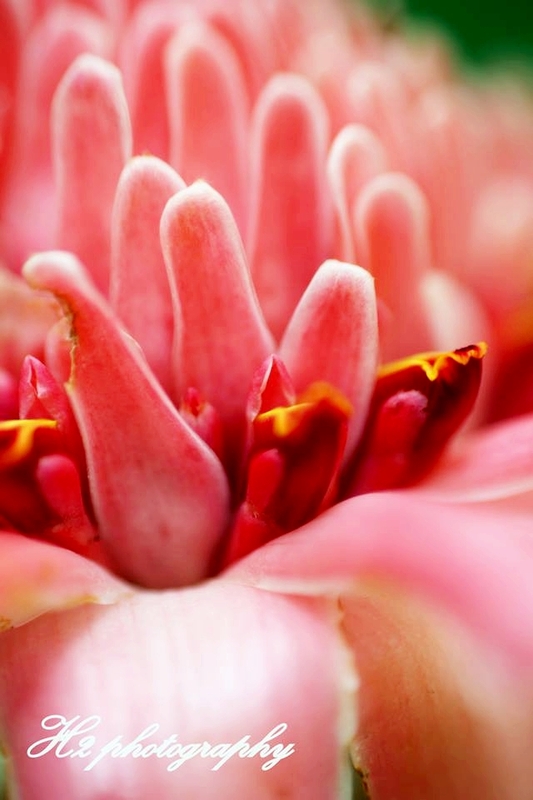 In this case, the photographer did a close-up on the flower’s stigma & stamen to present the flower in a totally different perspective – we love it! 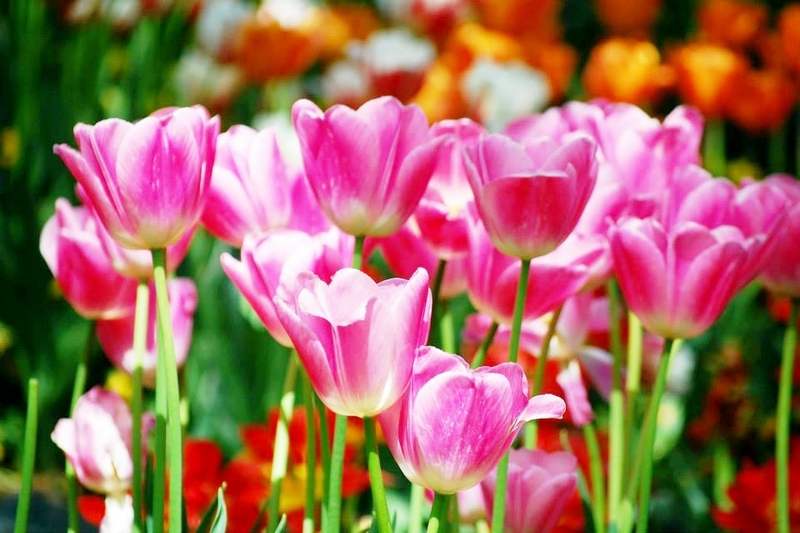 This image of a cluster of pink flowers are enough to cheer people up. This shot is filled with sweetness and lively joys and we simply love this! The orange color flowers in the background adds on to the bright & sunny feel! Pink is a favorite color for Product Packaging. The unmistakeable hues of pink are seen in all supermarkets from raw food to processed instant food that are used by different brands. This image is such an excellent example of how Pink found its way (and relevance) to the shelves. This is another interesting use of Pink. 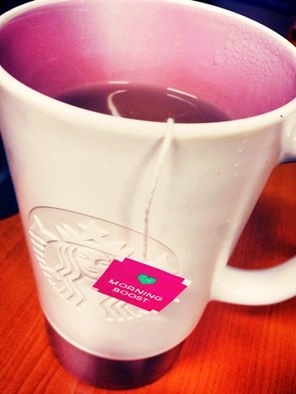 The tag morning “Morning Boost” again an etched Starbucks logo is interesting for anyone to start their day. If that is not enough, the insides on the mug is pink too! Pink Text interjoined into a ball. Interesting? We think this is awesome! 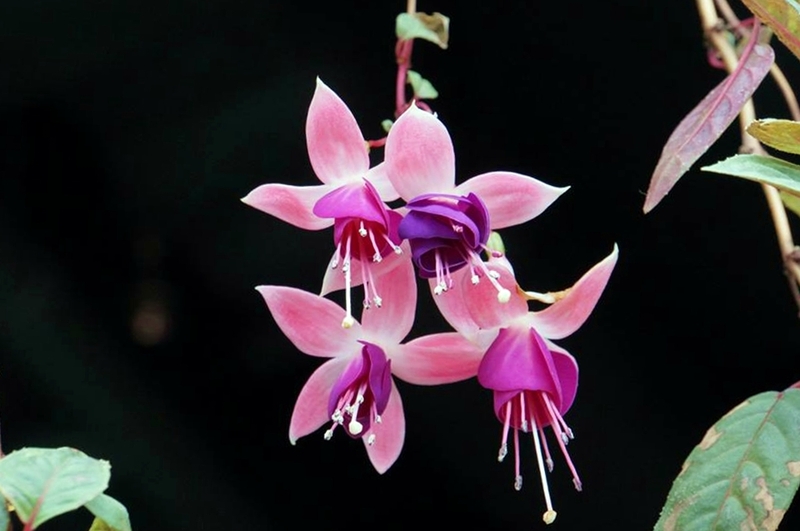 A Pink Plant Leader made it interesting for those starting to grow creepers. While waiting for the greeny leaves to grow, at least you have something sweet to stare it until the greens take over. These rubber bands are currently trending. With easy-to-make kit or starter kits available at a great price, it is no wonder that people are starting to play with these. 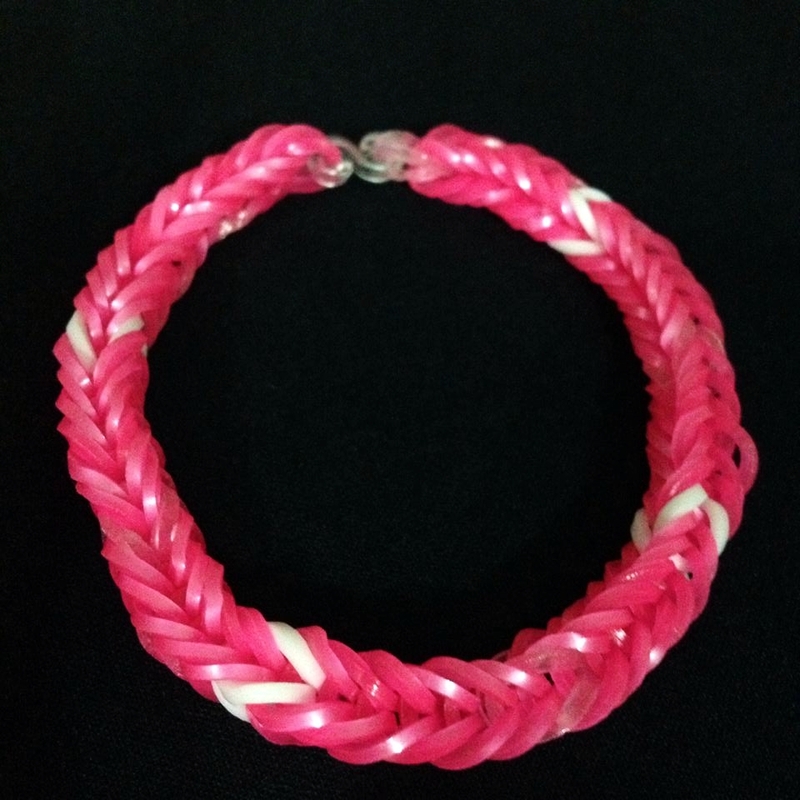 This pink example is simple while the maker added 4 x white rubber bands to create a simple but prive design. White & Pink is like Jack Daniels & Ice. 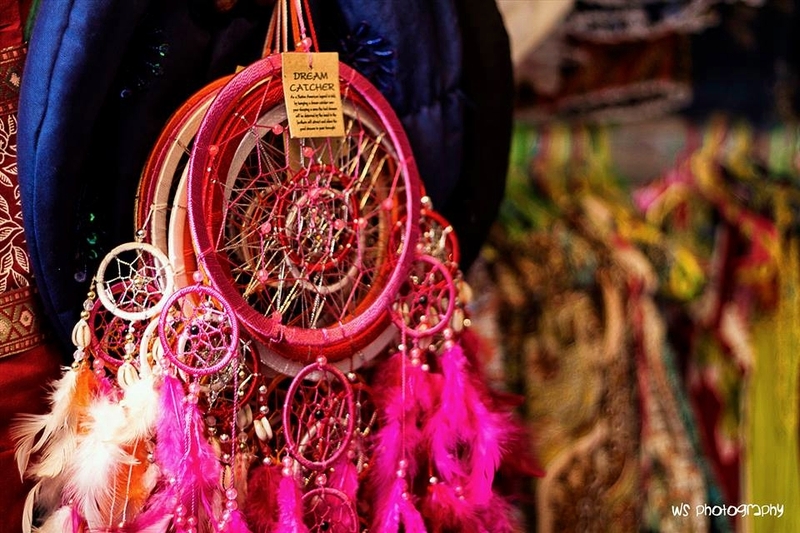 Pink Dream Catchers, if you are a believer of Dream Catchers, this Pink version will be nice for you to have it in your bed room. Guaranteed sweet dreams after! We have come to the end of the selected submissions and by now, many of you would have observed that Pink is in fact one of the most versatile color available to us. It has a wide representations and its definitions is limited to what you have in your mind. 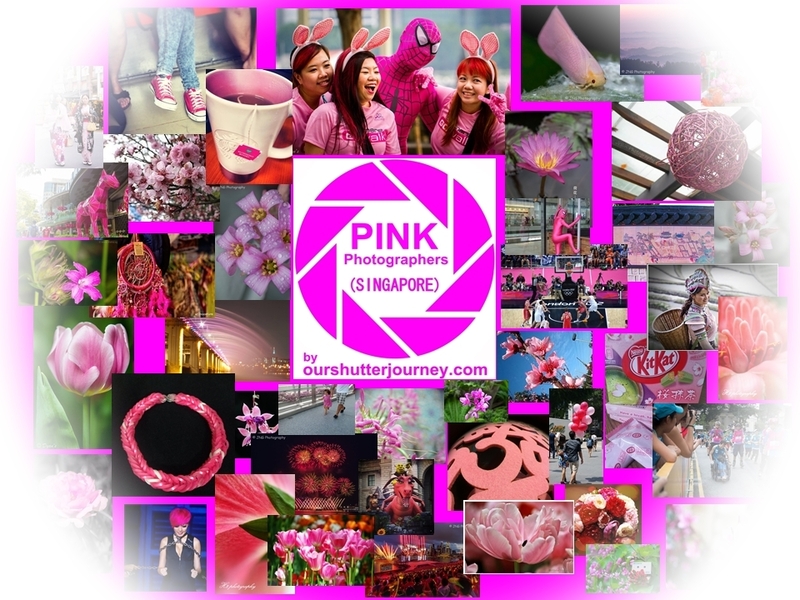 Before you scroll to the winning entries below, I would like to thank everyone who participated in this exercise as well as a masked publicity campaign for Pink Photographers Singapore (PPSG). And the Prize Winners for the PINK SUBMISSION are! Special Thanks to Sgcamerastore for sponsoring the Prizes! 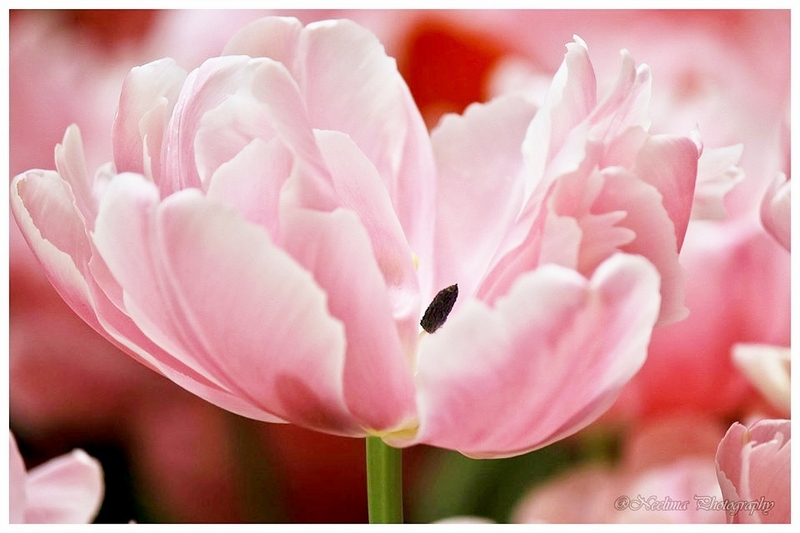 This entry was posted in Featured Photographers, Featured Photography Groups, Featured Photography Merchants, Photography Articles & Videos, Photography Contests, Uncategorized and tagged Featured Photographer, Photography Contest, Pink, Pink Photographers SG, PPSG, Sgcamerastore. Bookmark the permalink.